Chronic kidney failure is a common condition in older cats. As the name suggests, chronic kidney failure means that the kidneys have not been functioning properly for a long time. Unfortunately, owners don't always catch the early signs of this condition, and as a result it is often diagnosed at a late stage. If you notice that your ageing cat is becoming slow, has a reduced appetite and a dull coat, is losing weight or drinking and urinating more than he used to, getting him checked over by your veterinarian is a good idea. It is possible that his kidney function is deteriorating. The kidneys have various essential functions in the cat's body. They maintain the body's moisture balance by secreting more or less water in the urine. They also function as a filter, removing waste products from the blood and disposing of these products along with water in the form of urine, whilst retaining the "good" substances in the body. In addition, the kidneys produce various substances that are important for calcium balance, blood pressure and the production of red blood cells. Just like humans, cats have two kidneys. They are bean-shaped organs of about 3 cm in size. Kidneys are made of thousands of smaller functional units, nephrons, which filter the blood. In young and healthy animals, not all nephrons are active at once. Some nephrons are kept as reserves. Some nephrons die, due to ageing or damage to the kidneys. The reserve nephrons take over their function, until finally all nephrons are active. When there are no reserve nephrons left, but the kidneys continue to be damaged, the cat will start to show signs of chronic kidney failure. Chronic kidney failure is a common condition in cats from the age of 9 onwards. In cats with this condition, part of the kidneys are irreparably damaged. There are various causes for chronic renal insufficiency. Unfortunately, it is usually impossible to pin down the exact cause, because the condition starts before the symptoms become apparent. Due to the reserve capacity, the symptoms only become noticeable when 75% of the kidney function is already lost. The first symptoms are usually quite subtle, like a dull coat and listlessness. It may also slowly become noticeable over time that the cat is urinating more in the litter tray. Often, these initial signs of chronic kidney failure are not recognised or dismissed as signs of old age. If the symptoms are not treated, the kidneys will deteriorate further and more severe symptoms may occur. The loss of functioning nephrons has a negative impact on all of the normal functions of the kidneys. The kidneys let too much water pass through into the urine and therefore retain too little water in the body. To compensate, your cat will start drinking more. If your cat cannot drink enough, he will get dehydrated. The kidneys also struggle to dispose of waste from the body and this will continue to circulate in the bloodstream. This waste will become toxic for your cat. The main waste product causing problems is urea, a waste product from the protein metabolism. Urea makes your cat feel nauseous and may cause little ulcers in his mouth and stomach. The nausea and pain from the ulcers can cause vomiting and a reduced appetite, leading to weight loss. Because the filter function of the kidneys is not as effective as it used to be, proteins are passed in the urine. As a result, the body will start to use its own muscles to release proteins. The hormone-production capacity of the kidneys is also affected, which has the necessary consequences. These may include anaemia, due to the lack of the EPO hormone. This can make cats slow and apathetic. The anaemia can get worse as a result of blood loss from stomach and mouth ulcers. Kidney damage often affects the blood pressure regulation centre as well, leading to high blood pressure. In turn, high blood pressure may cause further damage to the kidneys. Usually, cat owners will not notice when their cat suffers from high blood pressure. Symptoms only occur at a late stage, including bleeding in the eyes, blindness and heart problems. Chronic kidney failure is not hard to diagnose. Based on the symptoms and an examination, your veterinarian will often suspect renal insufficiency. This suspicion can be confirmed by carrying out a urine test and a blood test. Your veterinarian may also check your pet's blood pressure. The urine is checked for proteins and inflammation, and the specific weight is determined. This is used to measure the dilution of the urine. This shows how well the kidneys can concentrate urine. In the blood tests, so-called kidney values show whether or not there is kidney disease. In case of kidney failure, the waste materials urea and creatinine are no longer effectively excreted and therefore provide a good way of measuring kidney function. Creatinine is a degradation product from protein that occurs in the muscle tissue. In healthy animals, the creatinine value in the blood is reasonably stable, because it is constantly excreted with the urine. In cases where there is over 60% kidney damage, the nephrons are no longer able to process all of the creatinine in the blood, and therefore the creatinine value of the blood increases. Another blood test has also recently become available (SDMA). This can detect renal failure earlier, at 25% to 40% reduction of kidney function. The aforementioned substance of urea also shows how effective the kidney function is. In a reduced kidney function, the urea is no longer excreted effectively, and its levels in the blood will increase. Phosphate is another parameter for kidney function. Phosphate is a salt that affects important processes in the body. In cases of renal insufficiency, the phosphate level may increase, because the body is incapable of secreting it. An excess of phosphate in the blood is harmful to your cat. Because cats with renal insufficiency run an increased risk of high blood pressure, this is often checked by your veterinarian. This process is comparable to a blood pressure check in humans; using an inflatable cuff and a Doppler meter. If a cat's blood pressure is high, medication can be prescribed to treat this. Unfortunately, kidney failure cannot be cured, and treatment is therefore focused on slowing the deterioration of the kidney function. If severe kidney failure is diagnosed, with symptoms such as refusing to eat, vomiting, dehydration, weight loss and apathy, the cat will need to be admitted to a veterinary clinic for a few days. In order to treat dehydration and flush out the kidneys properly, the cat will be put on a drip, administering fluids directly into the bloodstream. The cat will also be given medication to combat nausea. If the cat refuses to eat, it will have to be force fed. If, after a few days of intensive treatment, the kidney values in the blood have reduced sufficiently, the cat can go home and be put on a special kidney diet and medication. If the kidney failure is diagnosed relatively early, before severe symptoms occur, the cat will not need to be admitted. The cat can go home, but is put on special food and medication. To optimise the flushing of the kidneys, you must ensure that your cat drinks as much water as possible. Drinking can be stimulated with a drinking fountain, for example. Wet food or softened dry food is preferable to dry food, as it means that the cat gets water with his food. Nutrition plays an essential role in the treatment of chronic kidney failure. The cat will have to be given a special kidney diet for the rest of its life. A kidney diet contains fewer proteins than standard food, and the protein that it contains is of a better quality. 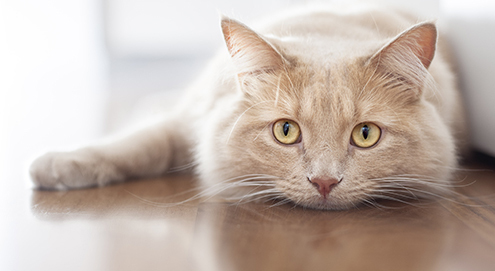 This will lead to a reduced urea production, which means your cat will feel less ill. If the blood tests show that the phosphate level in the blood is increased, phosphate binders will be prescribed. These will ensure that phosphate in the food is bound, so that fewer phosphates are released into the bloodstream. If the blood is low on potassium, a supplement must be given for this. Sometimes other medication is also prescribed, such as medication to lower the blood pressure or to prevent the excretion of protein in the urine. Although, once damaged, the kidneys will never recover, with the right treatment the cat can have a good quality of life. However, the prognosis of chronic kidney failure varies widely. Some cats deteriorate very quickly and do not respond well to treatment. Other cats can live a happy life for many years with the right treatment. If you recognise symptoms of kidney failure in your cat, getting your cat checked over by a veterinarian is sensible. Some veterinarians also offer a senior check, in which they carry out a general overall examination as well as a blood test to check kidney function, among other things. This is definitely recommended in older cats. Should any problems be found, it is more likely that you have caught it in good time and can start treatment early. The sooner you start taking kidney-saving measures, the better the prognosis. For cats with kidney disorders or bladder stones. To support renal function in dogs & cats. For cats with kidney disorders. For chronic renal failure in cats & dogs. For bladder, kidney & urinary tract disorders.